Looking for a memorable vacation memory to share with your family and friends? Wild River Adventures is ready and waiting to take you on an extraordinary Idaho white water rafting trip down the beautiful Salmon River of No Return. Center Mount Raft: Our guide does all of the work, and your job is to hang out and hang on. Stern Mount Raft: Grab a paddle and dig in because everyone helps move the raft. Inflatable Kayaks: It’s all you, baby. This half-day excursion is perfect if you’re short on time but want to get a little river time in. We’ll float the 10-mile stretch of the Salmon River between Riggins and Lucile that combines deep, calm pools with a series of rapids that are guaranteed to give you a grin. Beverages and light snacks are provided. Launching from Spring Bar, you’ll float through 20 miles of one of the most beautiful sections of Idaho’s Salmon River. After several miles of rapids and drops, we’ll stop at a white sand beach for an extensive deli sandwich lunch spread. Then, it’s back on the river for more rapids, and a stop to explore historical sites. You’ll arrive at the Lucile Recreation Site take-out at about 4:30pm where you board the Wild River Adventures’s shuttle for return to our office. Beverages, light snacks and lunch are provided. Launching from Vinegar Creek, this 40-mile section of the Salmon River features white water rapids, common sightings of Idaho’s varied wildlife, and beautiful beaches for comfortable camping. After a day on the water, you’ll relax as we set up camp and take care of the cooking. While you wait, we’ve got a great selection of beach games to play. Rather bury your feet in the sand and read a bit? We pack a traveling library with us! After breakfast the next morning, it’s back on the river, and we’re on our way to the take out at Lucile. Beverages, light snacks and meals are provided. Launching at Hammer Creek, this trip shows off 56 miles of the Lower Gorge of the Salmon River to perfection. Commonly sighted wildlife includes hawks, eagles, sheep, and deer. And the rapids? They’re rollercoaster worthy! We’ll land at the confluence of the Salmon and Snake rivers in Hells Canyon. 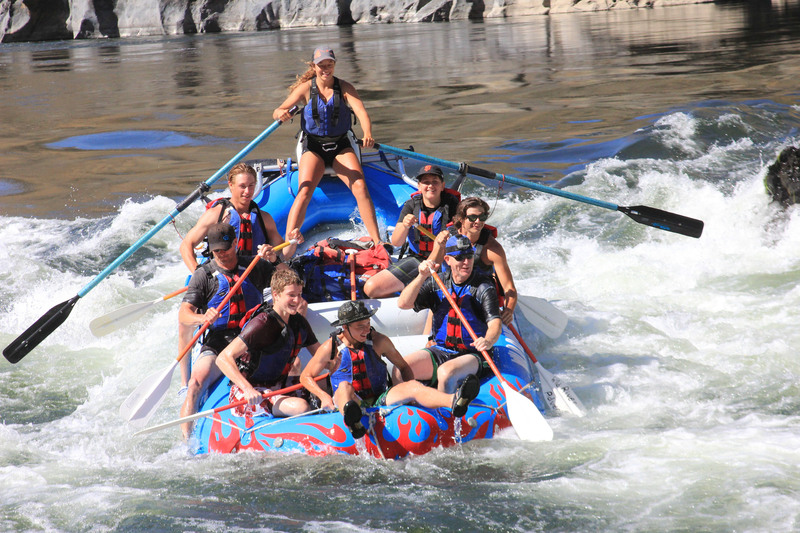 Consider upgrading from our passenger van shuttle to an exciting and breathtaking jet boat trip back up the canyon to Riggins! (Call for jet back pricing.) Beverages, light snacks and meals are provided. Everything the three-day trip delivers plus one extra-leisurely day and night on the river! That means more camping, more sandy beaches, more delicious food, more stargazing and more wildlife. What’s not to love? Beverages, light snacks and meals are provided. 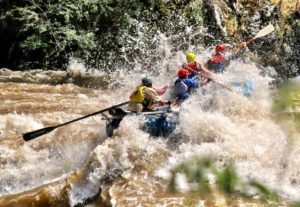 While we’re all about fun and excitement, we believe in “Safety First.” Each of our experienced, licensed guides is fully trained on every section of the river we run. We provide all necessary safety equipment, and you’ll receive a thorough and informative safety talk before you get on the water. Each trip begins at our headquarters at 419 N Main Highway 95, Riggins, Idaho. We provide transportation to and from the launch areas, any wetsuits or splash gear you need, and dry-storage on the raft. Prices include all taxes and 3% BLM fee.